Whether you’re trying to spice up your e-learning by adding a game element like a branching scenario, or you’re designing a complex and game-like course, good content design is undeniably the foundation for creating a positive learning experience. 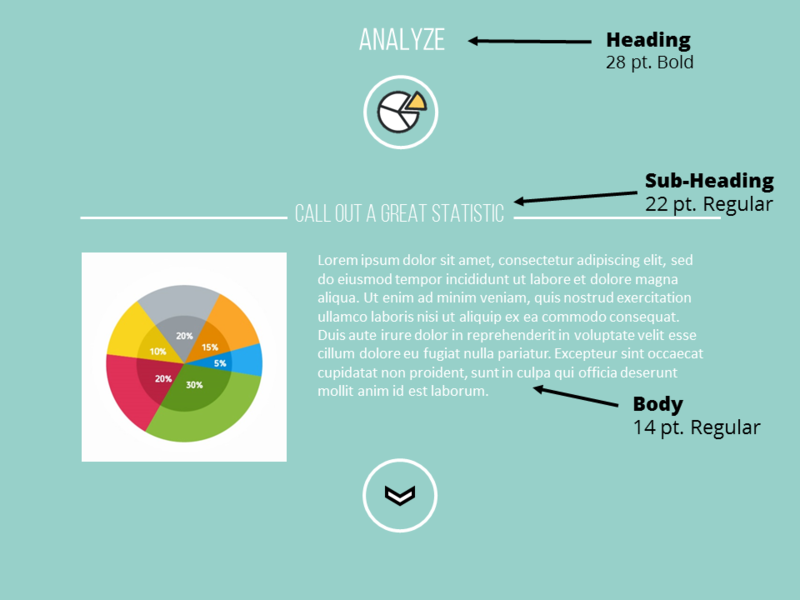 But at the end of the day, having great content that’s well written and structured is only half the battle; you also need strong visual design to elevate your content and connect the dots for your learners. This is particularly true for e-learning gamification. That’s because many of the fundamental game design elements identified by Dr. Karl Kapp—engagement, mastery, autonomy, and progression—are more compelling (and effective) when the visual design rises to the occasion, immersing and supporting learners to achieve the goals of the course. Tip #1: Look to Your Content to Help You Find a Visual "Hook"
Just like a writer uses words to give their material a “hook”—that little something that entices the reader and pulls them into the story—your content can help you come up with a visual or a motif that draws your audience into the learning experience. Unfortunately, our content doesn’t always speak to us the way we’d like. With visual design, there are no easy-peasy, right or wrong answers when it comes to visually interpreting content. In fact, Articulate’s E-Learning Challenges and E-Learning Examples hubs are both chock-full of community-contributed examples demonstrating the many different ways designers can visually treat very similar content. Following are two such examples that we can compare and contrast. 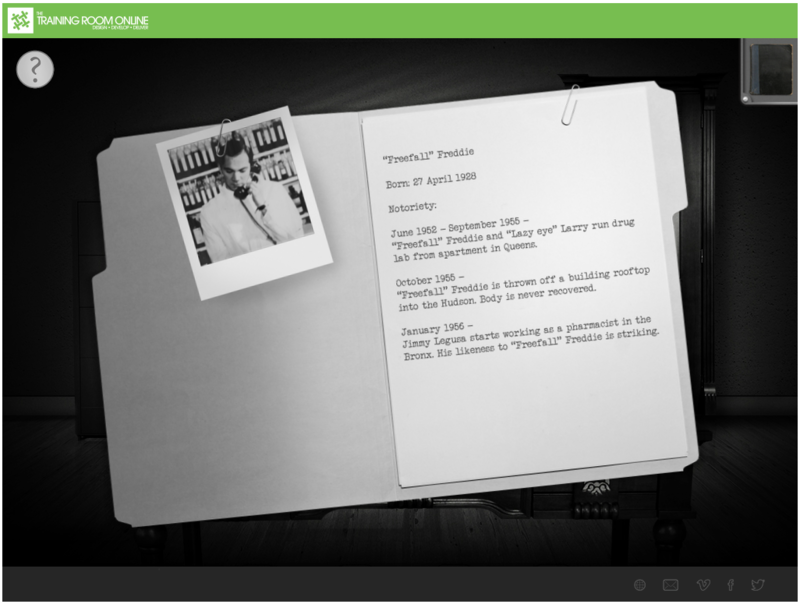 Example #1: In this Articulate Guru Honorable Mention, Kate Atkinson from The Training Room Online lets learners take on the role of a private detective investigating a case of pharmacy fraud. The subject matter is certainly quite serious, but the snappy writing keeps it from being too gloomy. Visually, the use of a moody black-and-white film noir look immerses you into each environment, making for a involving, fun, and challenging experience. Example #2: In The Bicycle Thief, Hero Nancy Woinoski at Pinched Head took a similar content design approach by inviting the learner to investigate a case of a stolen bicycle. In Nancy’s interpretation of the detective genre, she uses a colorful illustrated treatment to hook learners and immerse them into her story. Instead of the edgy vintage feel which suited the mood of the subject matter in the previous example, the tone of Nancy's subject matter is a little more playful, with a visual treatment to match. Drawing inspiration from your content can help you identify a visual hook and then narrow in on a distinct interpretation of that motif. 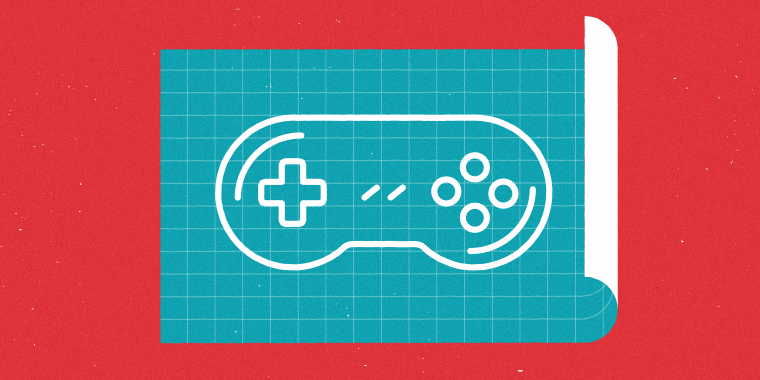 For more pointers on applying game elements and techniques to your e-learning, check out this helpful article from Nicole Legault, "Gamification Techniques: How to Apply Them to E-Learning." When it comes to creating a cohesive visual design, don’t stop at graphics! Above and beyond conveying information to the learner, typography plays a huge role in conveying the mood and personality of your design. Have a fun, lighthearted subject? Consider using fonts that complement the mood with a whimsical or casual flair. Script or handwriting fonts are great examples of fonts you can use for conveying a more relaxed mood. Exploring a more serious topic? Stick with fonts that are less decorative and more clean and straightforward in their styling, like Open Sans (a sans-serif font) or Rockwell (a serif font). 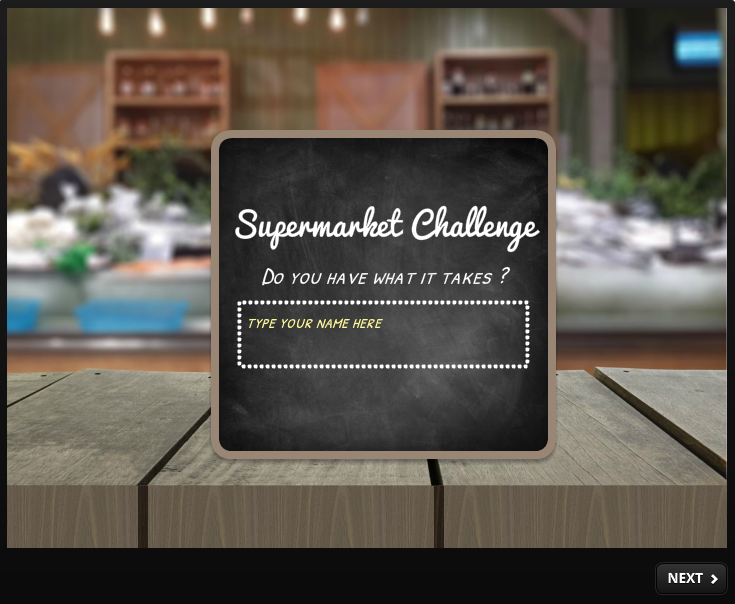 For one example of coordinating font personality with subject matter, take a look at this recent gamified grocery-themed drag & drop download. I used a casual but easy-to-read handwriting font, Patrick Hand, as body text and combined it with a more stylized scripted font, Pacifico, for headings. I found that these two fonts not only complemented my grocery store theme by referencing the trend of grocery store chalkboard art, but they also scaled well and were pretty easy to read. This brings up an important caveat when choosing typefaces: readability always trumps style. The initial typeface I chose for my body text was a little more elaborate and less readable than I wanted, so I ended up replacing it with Patrick Hand. If the typeface you’ve fallen in love with just doesn’t scale or is too hard to read, you may be better off using a less stylized font, or reserving that more stylized choice for accent text. With all of the lovely visuals you can use to bring a more game-like feel to your e-learning, it can be easy to lose sight of basics like navigation buttons. But navigation needs love, too! In fact, having clear and intuitive navigation is especially important for gamified e-learning because it’s often nonlinear, which means clicking the “Next” button probably isn’t going to move you through the course. And, added to the increased navigational complexity of gamified e-learning is the visual complexity that a richer design brings. All of that visual input can leave learners feeling overwhelmed or confused about where to click. So how do you create a visual design with navigation that’s styled to be on-theme, consistent, and intuitive? Try using contrast and repetition. Creating contrast in onscreen elements is important because it helps learners distinguish between screen objects. In short, contrast is all about catching the learner’s eye. You can create contrast in many different ways, including varying the sizes, weights, or styles of text to denote hierarchy and add emphasis. You can also create contrast with color or hue to draw attention to specific onscreen objects or text, as I’ve done in the Creative Tabs template example below. Repetition is all about repeating elements so the learner doesn’t have to put a lot of thought into finding or figuring out how to interact with objects like navigation buttons. For instance, style navigation buttons or icons in a way that’s similar to the rest of your graphic elements and then stick with that styling throughout the course. 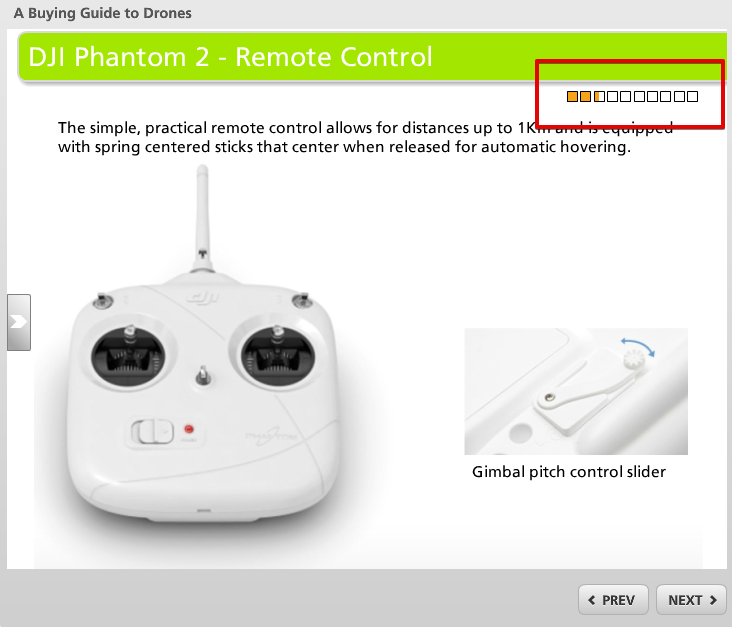 You can also save learners from having to hunt for where to click by placing navigation buttons in the same spot throughout the course. For an example of both contrast and repetition of navigation, check out this outstanding job interview simulation created by Nicole Legault. I love how Nicole chose to use a grayscale background to make her interviewer, Erica, stand out. And using contrast also makes the progress meter at the bottom pop (more on that in a moment ...). She also cleverly placed everything on the left so that within the first few screens, you’ve established a mental rhythm of sorts, instinctively directing your attention to the left for the next piece of feedback or to see more choices. Using stylized, consistent, and intuitive navigation is one of the easiest things you can do to create a more cohesive and immersive experience for learners. If you’d like to learn more about it, David Anderson wrote a fantastic article, 3 Essential Visual Design Concepts, that walks through all of the basics with even more tips and examples. When it comes to pulling learners into a setting or a situation and allowing them some free rein to explore and maybe even experience the consequences of their choices, it’s tough to beat the emotional impact and engagement of interactive video. It’s one of the best visual design tools in your gamification arsenal! That’s because in typical e-learning courses, video is more often used as a way to lecture learners rather than engage them in a conversation or an activity. But with interactive video, you can introduce a cast of characters, set the stage for an activity, or let learners choose their own adventure and learn from their mistakes along the way. The creative possibilities are endless. 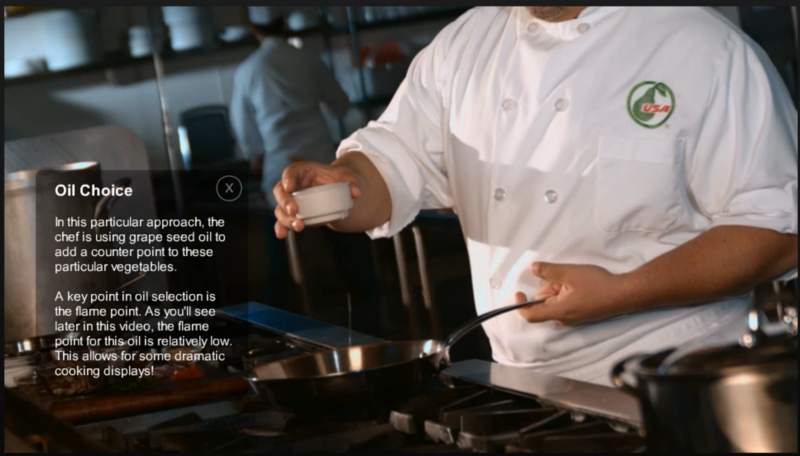 In this simple example from Mike Enders, he demos one approach for adding interactivity with video using hotspots and layers in Articulate Storyline. This approach can help you give more context to the video or it can help you to prompt critical thinking and decision-making in learners. 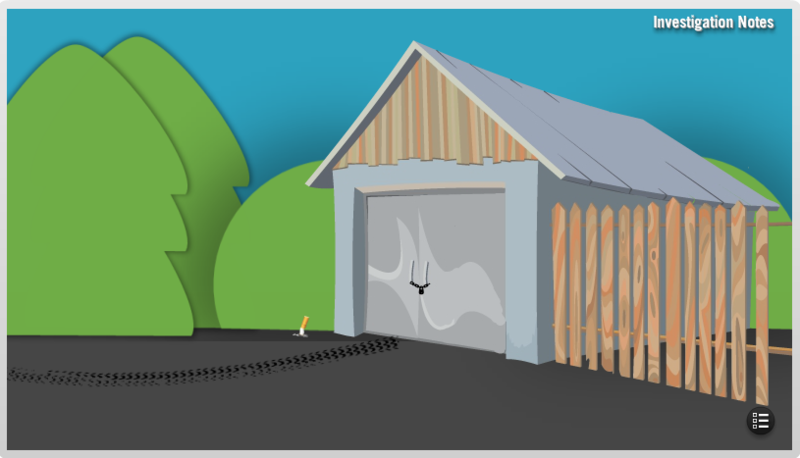 To take it to the next level, check out this charming Storyline example from Super Hero Phil Mayors from E-Learning Lab. 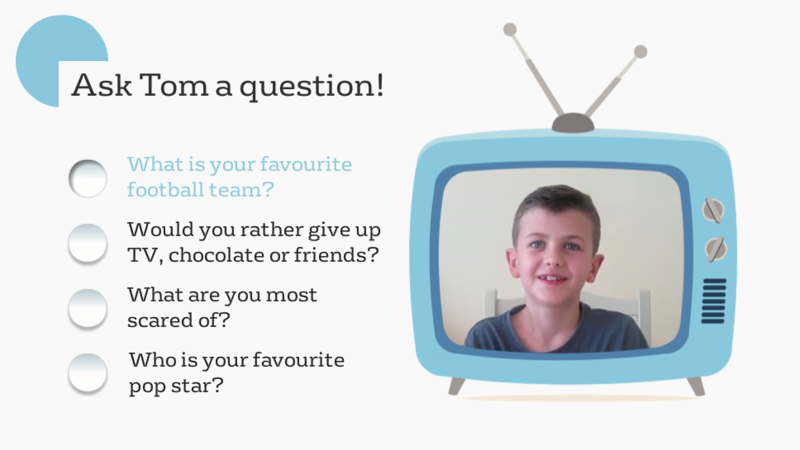 He shared this demo in our Interactive Video Interviews Challenge—which is also full of inspiring e-learning goodness. I like how Phil integrated the video into his visual design, making for a fresh and compelling way to learn more about Tom (who seems like a pretty interesting 'fella!). As I mentioned at the beginning, one of the foundational elements of gamification is progression. A visual indicator of progress helps learners see how they’re doing and how much further they have to go before achieving mastery. One way to show progress is with a simple dot metaphor, as shown in this nifty example from Hero Michael Hinze. 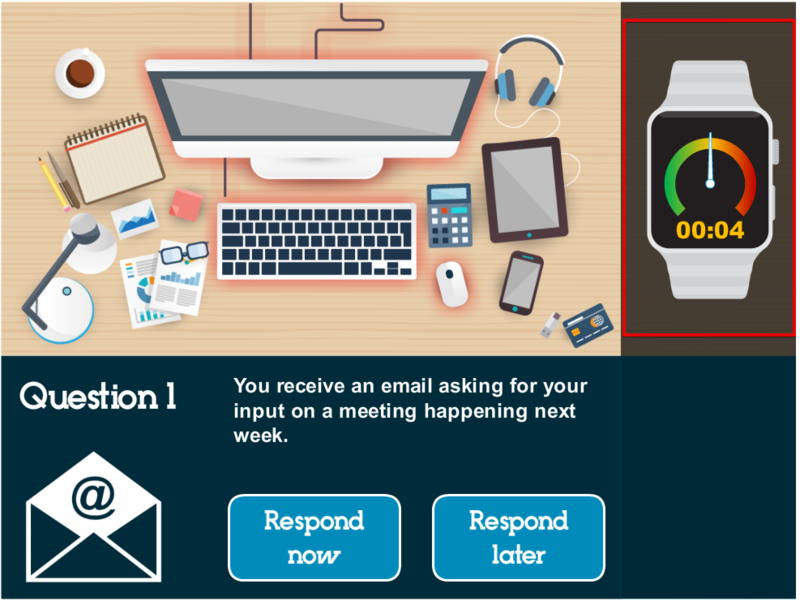 Another take on progress meters can be seen in this delightful example of a gamified time management course. Designer Phil Eagles at Bray Leino Learning combined a simple meter with a timer to give learners a sense of urgency along with some easy-to-interpret visual feedback on their choices. Looking for even more visual design ideas for showing progress? Don't miss this E-Learning Challenge, “Using Progress Meters in E-Learning,” to see loads of inspiring ideas and examples. 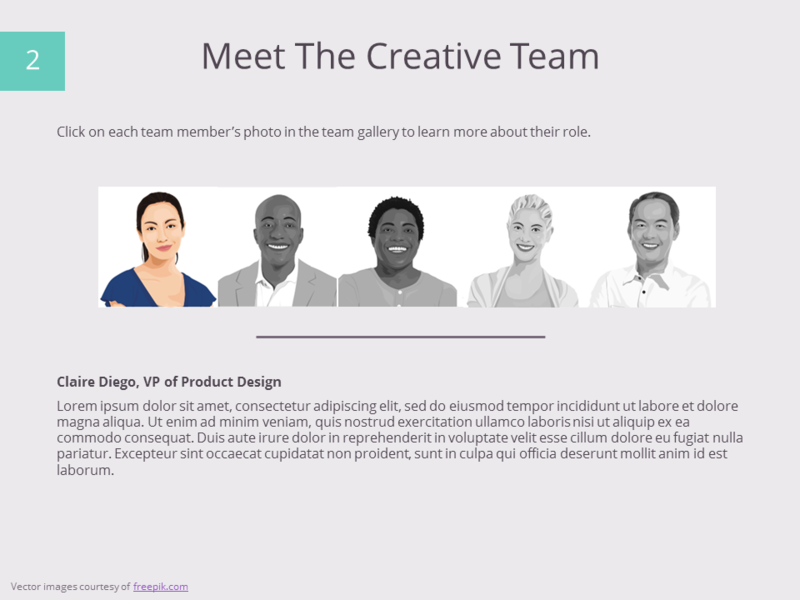 What are your e-learning visual design challenges? Share them with us in the comments and we’ll chime in with some community brainpower!